Photobiomodulation is a promising treatment for several neuro-degenerative diseases. However, few studies have been done regarding Multiple Sclerosis. In this blog I describe my experiments with reducing MS related fatigue. Multiple sclerosis (MS) is a chronic neurodegenerative auto-immune disease, that damages the insulating myelin sheath of nerve cells in the brain and spinal cord. It affects approximately 2.5 million people worldwide. Patients experience a wide spectrum of (neurological) symptoms. Often reported are fatigue and cognitive impairment, that interfere with normal daily functioning and quality of life. Photobiomodulation (PBM) is a treatment that uses red and near infrared light to increase healing and decrease inflammation and pain. PBM – formerly known as Low-Level Laser Therapy (LLLT) – is well researched with many reviews and clinical trials, but still a non-conventional therapy. One of the main biological effects of PBM is on mitochondria, where it increases ATP production. The fundamental difference with a pharmaceutical approach is that photons instead of chemicals are used to induce changes in biochemistry. Promising results with shining near infrared light on the brain – also known as transcranial photobiomodulation (tPBM) – have been achieved for various neurodegenerative diseases like Alzheimers and Parkinson’s. For MS however, not a lot of research has been done yet. In the next paragraph I’ll give a short overview of few the studies I found. The first study was done in Poland in 2003, treating around 100 MS patients with 632 nm laser light, and reported substantial objective and subjective improvements. After this human study, most studies used a mouse model of MS. Like those of the University of Wisconsin – Milwaukee in 2012 and 2013 where mice with early MS-like symptoms were treated with 670 nm ‘full body’ LED light for a week, alternating with a week of no light. The clinical condition of the mice improved. In 2016 the group of Gonçalves in Brazil used 660 and 904 nm laser light to treat a mouse model of MS (EAE) and concluded that their results suggest the use of LLLT as a therapeutic application during autoimmune neuroinflammatory responses, such as MS. Also in Brazil in 2018 by a group of Universidade Federal de São Paulo led by Duarte found that amongst other things laser-treated (808 nm transcranially) animals presented motor performance improvement and attenuation of demyelination. The University of Nove de Julho in Brazil is currently (2018) doing a clinical trial: ‘Effect of Photobiomodulation Treatment in Individuals With Multiple Sclerosis.‘ They are shining laser light on the sublingual region, the spinal cord and the radial artery of 34 participants. All studies have produced positive outcomes. Looking closely at the photobiomodulation research, one can notice that there are many treatment parameters. There can be differences in the light source used (laser or LED), the frequency (600-1200 nm), signal type (continuous or pulsed (freq/duty cycle)) treatment location, target tissue, dose, treatment surface and more. An important part of the way forward is to find the most effective treatment protocols, to assist both neurologists and patients. Probably this overview is not complete; there may be more research available in the Russian or Chinese language. Hereunder some details of my experiments & preparation of formal study. In the spring of 2017 I asked John – a MS patient I know – whether he would be interested to see if infrared light could benefit his condition. He was en so we started some experiments. The first questions were: where to shine the light, what dose and how would we know it was beneficial? After some time it became clear that after treatment he needed less (daytime) sleep. Please find the details below. This is a case study of one subject (n=1) a 63 year old male with Secondary Progressive MS.
We used several devices but mostly a 850 nm LED array, consisting of 15 3000mW powerleds with 30 degrees beam angle. We tried various locations including: the head, the spine, the radial artery (inside wrist) and hands. 1. In the past year I have found the best treatment location so far seems to be the prefrontal cortex. We have found some effects in the reduction of fatigue – a primary symptom of MS. Daytime sleep reduction of 30-60 minutes per day. The subject normally sleeps 2 hours (extra) after dinner early in the evening. He needs this to be able to function the rest of the day. 2. Also we could reduce MS related lower back pain, with local treatment on the lower back. Several treatment parameters – like the light source and the treatment locations – differ from other studies. We also use other – non-biochemical – outcome measures. My current goal is to quantify these self reported results and publish these in a case study. The Brain Gauge (Pro) to measure brain function (cortical metrics) using tactile tests. CogEval is an iPad-based Processing Speed Test (PST). It is based on the Symbol Digit Modalities Test – an assessment developed to evaluate cognitive function in MS patients. It uses elements of attention, psychomotor speed, visual processing and working memory. Oura ring – a wearable fitness tracker with great accuracy in sleep tracking – at night. We found out (April 2019) that it doesn’t track daytime sleep (naps) in a reliable fashion however. These are all non-invasive, low cost and easy to use ‘quantified self’ tools, that don’t take a lot of time or energy from the patient to comply. Brain Gauge, CogEval & Oura ring. To eliminate placebo effects the subject will receive both active and sham treatments. Generally in photobiomodulation a subject could recognise the active treatment in several ways: seeing the light (even with NIR (LED’s) there is often some leakage into the visible spectrum), feeling a glow (warmth) or feeling the effect of the treatment on the skin. According to Michael Hamblin this phenomenon is caused by the release of nitric oxide. The last two factors are more at play when treating areas of the body that have a high sensory nerve density, like the hands or face. When a subject is visually blinded, the awareness of the other senses becomes usually more prominent. So my plan is now to blind the subject with a sleeping mask and use an extra heat lamp (wide spectrum: red, nir & mir) at a distance to induce just a little heat on the skin. There are at least two things to consider when treating MS patients with infrared light. First of all, heat intolerance may cause a temporary worsening of MS-related symptoms in some patients. This is known as Uhthoff’s phenomenon. 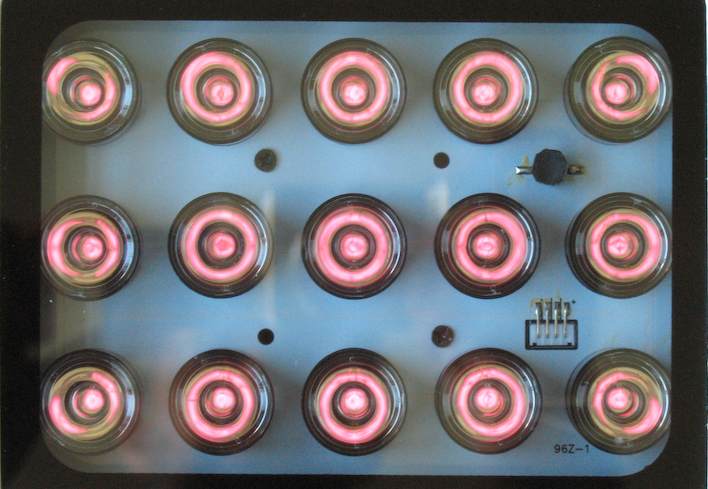 Heating can be prevented by using a narrow spectrum light source without mid and far infrared – and even without the upper part of the near infrared band. This is to avoid wavelengths that fall into the absorption spectrum of liquid water and so could cause heating. Also keeping the lamp at a big enough distance and starting with a low dose contribute to a safe treatment. A second risk may occur when using pulsed tPBM. Pulsing the light at frequencies of around 40 Hz may activate an autoimmune attack of microglia on myelin. This has been suggested by Dr. Lew Lim – PBM researcher and founder and CEO of Vielight. For basic safety: The patient is monitored by the St Antonius hospital in Utrecht, The Netherlands via an online questionnaire every two weeks and yearly seen by a neurologist. How does near infrared light cause a reduction in sleep? There are many possible mechanisms and combinations thereof. Also, there can be different effects in different tissues. Within the first 5 cm of penetration we find blood, bone, dura, cerebrospinal fluid and brain. Moreover: some photobiomodulation effects are immediate, others take hours or days to occur. (increased stem cell production, genetic up/down regulation, ….) So, at this point I have no answer to this question. Enhanced mitochondrial function is a good candidate however, as mitochondrial dysfunction and oxidative stress contribute to chronic MS. An interesting observation is that for sleep reduction it seems that a short transcranial exposure is as effective as a 2-3 times longer lower back exposure. * Finding a LED device that is suitable for scientific context – calibrated and with accurate specs. * Finding a spectro(radio)meter to measure the light from the LED device. * Through the eyes (40 Hz) MIT. * Pulsing might allow for higher power (deep penetration) because (depending on the duty cycle) there is a cooling phase. * Does 810 nm penetrate significantly deeper than 850 nm? * Experimental autoimmune encephalomyelitis (EAE) is the most commonly studied animal model of multiple sclerosis (MS).